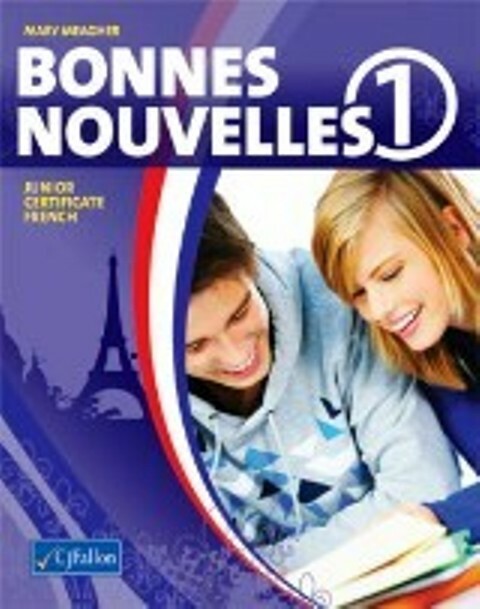 • Bonnes Nouvelles 1 is the first in a two-part series designed to prepare students for the Junior Certificate French examination. The student book and accompanying workbook have been written to introduce First Year students to the French language in an exciting and innovative way. In each of 8 themed units, students are encouraged to develop the key skills of listening, reading, writing and speaking. • Throughout the book, French and Irish ‘correspondents’ exchange information about their lifestyles, homes, hobbies and towns. This reinforces the vocabulary in an interesting student-friendly way. • Clear directions ensure a smooth transition from textbook to workbook. A wide variety of engaging exercises in the workbook enables the students to master the material presented in the textbook and provides them with a valuable record of work completed. The range and choice of exercises facilitate mixed-ability teaching and include crosswords, quizzes, close tests and comprehensions. • Unit 9 takes the students on an exciting and colourful tour of the regions of France and introduces them to the many cultural aspects of the country. Students can then approach the comprehension questions, quiz and crosswords in the workbook to reinforce their learning. • Unit 10 is a revision guide with practical pointers to consolidate work completed throughout the year. • Bonnes Nouvelles 1 is accompanied by 2 listening CDs.